Well-kept shoes contributes to a positive reflection on your appearance and represents your professionalism, attention to detail, conscientiousness, and confidence. A quality shoe shine and a new set of laces can easily spruce up your favorite pair of shoes. In addition, shoe repair and care adds value to your footwear investment, while helping protect your feet. Taking care of your shoes, purses, and belts not only makes good sense, it's easy to do with a professional here to assist with Shoe Repair! We also offer many preventative maintenance options and can show you how to extend the life of your favorite shoes and leather goods. We use the best quality Italian leather and Vibram products, combining old world techniques with new materials and solutions. Please bring your item(s) into the shop in order for us to give you the most accurate quote on both pricing and timing. Note, with repairs we accept cash, check, , , and for your convienance. Shoe repair adds value to your footwear investment. We can help save you money, make your shoes more comfortable and keep you looking good. Mens and womens heel & sole replacement. 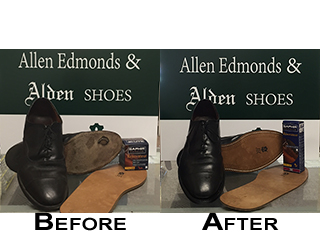 Shines not only make your shoes look like new, it helps extend the life of the shoe. Shoes can be professionally waterproofed to protect from salt stains. Ladies Heel tips can be changed from hard plastic to non-skid rubber. Protective oversoles can be applied to prolong the life of the leather soles. 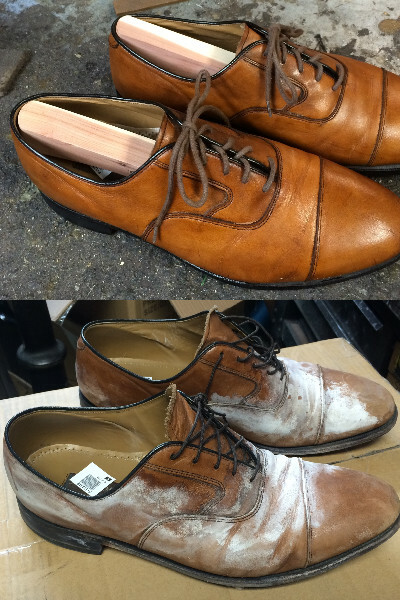 Refresh your shoes by dying lighter colored shoes to black or brown. Protective oversoles can be applied to extend sole life and increase slip resistance. Available in many colors through Vibram. So use your imagination and become unique. Shoes or boots that are too tight can be stretched. Heel plates and tips can be applied to prolong the life of the shoe and prevent more expensive repairs. Our expertise isn't limited to your feet. Bring in your item for us to look at and give you a quote!